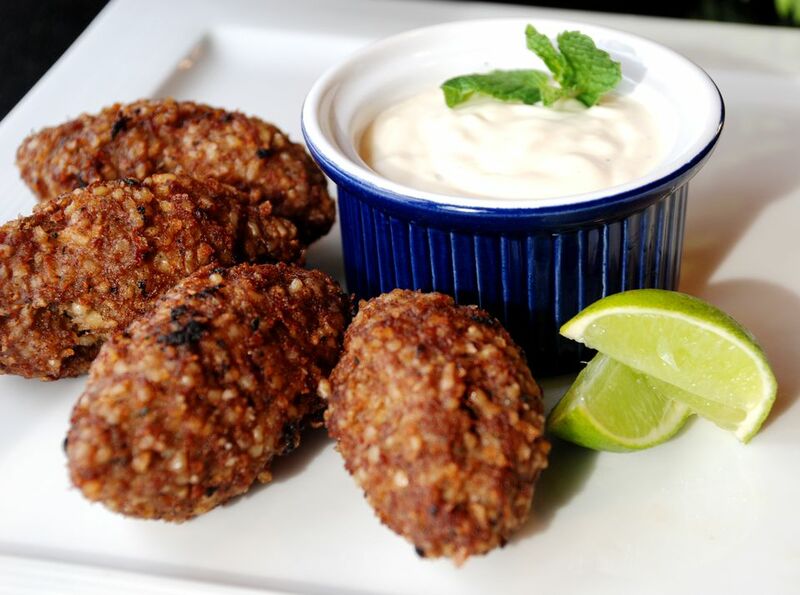 Kibe (pronounced kee-bee) are football-shaped deep-fried croquettes of beef and bulgur wheat, seasoned with garlic, onions, mint, and cinnamon, and eaten as a snack in Brazil. They are of Lebanese origin where they are made with ground lamb but in Brazil, typically they are made with ground beef. When the kibe are eaten raw, they are known as ​kibe cru. Kibe is served with lime wedges, tahini sauce for dipping, and traditionally, cold beer. Place the bulgur wheat in a heatproof bowl. In a small pot, bring the beef broth or water to a boil. Remove from heat and pour over the bulgur wheat. Let the wheat rest for 1/2 hour. Make the filling by placing 2 tablespoons olive oil in a skillet, and sauté half of the chopped onions, all of the minced garlic, all of the cinnamon, and all of the nutmeg. When onions are fragrant and soft, add 1/3 of the ground beef. Cook, stirring until the ground beef is well-browned. Stir in the parsley and cook 1 to 2 minutes more. Season with salt and pepper to taste. Set aside. Drain the bulgur wheat in a colander, pressing down on the wheat with the flat side of a spoon to press out all of the excess liquid. Place the bulgur wheat in the bowl of a food processor with the remaining (uncooked) ground beef, remaining raw onions, and mint leaves. Add 3/4 teaspoon salt and sprinkle generously with freshly ground black pepper. Process ground beef mixture until the mixture is very smooth, like a dough. If you have time to chill both the uncooked beef mixture and cooked filling for several hours, it will be easier to shape the kibe. Take golf ball-size balls of the uncooked beef mixture and press them flat into the palm of your hand. Place 1 tablespoon of the cooked beef mixture in the middle. Then close the "dough" around the filling and seal well. Shape the balls into elongated football-like ovals, with pointed ends. Place kibe on a baking sheet until ready to fry. Heat several inches of oil in a deep pot to 350 F.
Gently lower the kibe into the oil, working in batches, and cook until very dark brown and crispy. Drain the kibe on paper towels. Serve kibe warm with lime wedges and tahini sauce for dipping.